A web framework for the modern developer. Have you been looking for a bold new way of developing your web applications? Do you want to remove boilerplate and lower your development time and costs? The better way is here – now. Rails are so 19th century. What we need to lead us into the 21st is a new framework founded on forward-moving-thinking principles. What we need is INTERCAL on Interstates. In the fast-moving world of web development, you don't have time for boilerplate to get in your way. INTERCAL is a natural choice for rapid development, because it eschews structure in favor of lightweight, straightforward subroutines. INTERCAL on Interstates is founded upon four decades of language research. This kind of longevity is matched only by C and COBOL, and who wants to write C or COBOL? 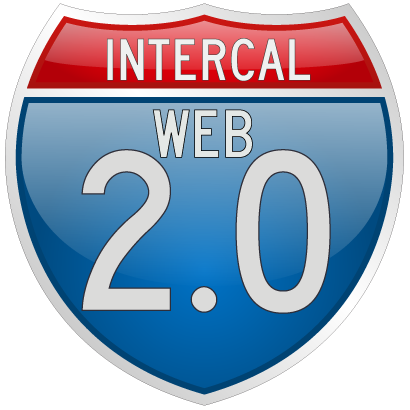 INTERCAL on Interstates and the entire INTERCAL environment clock in at under 3MB on a typical Linux system. This compactness is unmatched by any other commonly-available framework or language. INTERCAL on Interstates is built upon C-INTERCAL, allowing it to compile to native machine code. The speed afforded by real compilation ensures your webapps stay fast and responsive. Get INTERCAL on Interstates today!